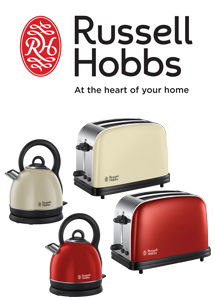 The new Westminster Collection from Russell Hobbs in an exclusive you don’t want to miss. The range is available in 2 colours Red and Cream. The 19192 and 19193 kettles have a large 1.8L capacity and perfect pout, other features include a 360˚ swivel base, 3kW rapid boil and rear water gauge. This new range also features the 23330 and 23334 2 slice toasters with a lift and look feature – so you can check your toast without cancelling the cycle, other features include Variable browning control and removable crumb tray.